These seriously chocolaty puds are great for eating with marshmallows and barbecued bananas or cantuccini biscuits. Break the chocolate into squares and place in a large bowl with the chopped marshmallows. In a pan over a moderate heat, bring the crème fraîche and milk to just below boiling point. Pour the cream mixture over the chocolate and marshmallows. Mix well until the ingredients have melted and combined. Pour into 6 ramekins. Leave to cool, then cover and chill in the fridge until set. Using the dying embers of the barbecue, or a griddle pan, barbecue the slices of banana for 1-2 minutes on each side. Serve with the chocolate pots, topped with extra marshmallows, and cantuccini biscuits. 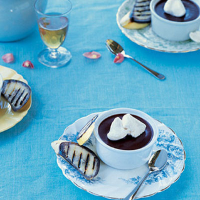 You can use the dying embers of a barbecue to turn the chocolate pots into individual fondues. Place the flameproof ramekins on the barbecue and leave them for 15 minutes or until fully melted and warm. Serve with slices of fresh seasonal fruit, some extra marshmallows and cantuccini biscuits to dip. Alternatively, you can microwave the ramekins at full power for 20-30 seconds.